No other American hardwood species is as revered as Black Walnut. High end furniture, architectural millwork, gun stocks and paneling are all markets smitten with the beauty of America’s naturally dark hardwood. In fact, walnut lumber often costs 3-4 times as much as red oak lumber. It is not unheard of to have logs fresh cut from the forest selling for over $4000. Most people are familiar with the dark brown heartwood of the walnut tree, but fewer people realize that walnut actually has a sap ring that is creamy white that forms a layer just under the bark. 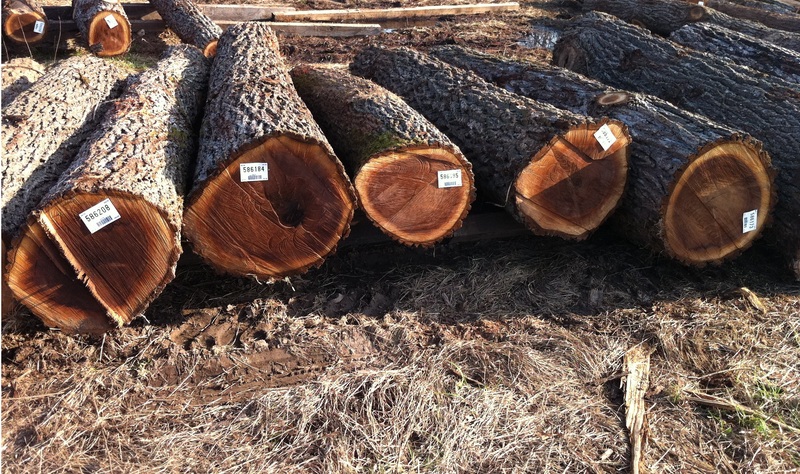 Here is a batch of walnut logs we recently purchased to process into wood flooring. As you can see in the picture, the creamy white sap ring is visible just beneath the bark. This white sap mixed in with the brown heartwood makes for a great wood floor with incredible natural variation in color and character. The above logs were turned into the wood flooring below. As you can see, in this particular product, we leave a mix of the white and brown for a truly unique wood floor. 3 1/4" Natural Walnut from Real Wood Floors Parkview collection. Hi there, just was mindful of your weblog through Google, and discovered that it’s truly informative. be benefited from the writing. Cheers!